I judge his past work. I believe at one stage he was making pertinent points about real world "conspiracies" but then he went astray. Same happened with David Shayler the former MI5 officer. I his case though I suspect something (drugs?) was done to make him come across as insane. He continues to make "pertinent points about real world "conspiracies" but some of his newer theories about Saturn and the moon seem unlikely even to me. Oh, you tease! Do tell, just a snippet of what he has to say - are Saturn and the Moon artificial, alien bases, human bases, illusions, something else? I love a bonkers theory as much as almost anyone, and have a soft spot for Icke (not least because I remember him presenting the snooker. I second that! I like hearing crazy theories. You are an agent of the reptiles! He continues to make "pertinent points about real world "conspiracies"
What's going on with the carpets at Wetherspoons? Does he have anything there? He says that we oughtn't stare at them for too long. He says Saturn is where Willy Wonka gets all his chocolate ideas from and the moon...well the moon is just the moon. THEIR infamous clash on a BBC chat show went down in television history and today (Sunday) David Icke has offered his condolences to the family of Terry Wogan – whose death was announced today. Following the news of the veteran broadcaster’s death, Isle of Wight-based David Icke posted on Twitter: "I have been asked today if I resent the way Terry handled our infamous interview in 1991. So was TW a lizzo? or maybe I should put my glasses on? has anyone on this thread actually read a David Icke Book? I have and he gives a lot of evidence for his claims. Read THE PERCEPTION DECEPTION and find out. He has actual evidence that the royal family are shape shifting aliens? That the Queen Mother ate small children? I'd like to see that. It's kind of hard to take him seriously in the context of what we know he's said. Whatever salient points or valid claims he makes about the world have to be measured against the seven foot tall shapeshifting alien lizard in the room. In the space of 15 days he met 12 people who told him they had seen people turn into reptilians. Coincidence? I think the person who saw the royals change was Arizona Wilder. Her story is hard to believe. He probably doesn't have good evidence, to be honest. A lot of his evidence is impossible to verify. "Arizona Wilder first came to prominence with the release of David Icke’s book “The Biggest Secret”, as rare “evidence” for his theory that the world is dominated by shape-shifting reptilians from other dimensions. The book’s index has the entry, “Wilder, Arizona – see Mother Goddess”, and she describes human sacrifice rituals involving the Pope, the Clintons, the Reagans, both George Bushes, various members of the Royal Family, the Rothchilds, the Rockefellers and the likes of Bob Hope and other celebrities. These summoned “snarling, hideous creatures” – how they distinguished them from participating politicians is unclear. Here’s her description of the Queen: “I have seen her sacrifice people and eat their flesh and drink their blood. One time she got so excited with blood lust that she didn’t cut the victim’s throat from left to right in the normal ritual, she just went crazy, stabbing and ripping at the flesh after she’d shape shifted into a reptilian. When she shape-shifts, she has a long reptile face, almost like a beak, and she’s an off-white colour”, she describes to David Icke in “The Biggest Secret”. You can get a videotape of an interview with her by David Icke called “Revelations Of A Mother Goddess”. Another opportunity to see Wilder speak occurred at the 2003 Conspiracy Con in Santa Clara." Arizona is not the only evidence of shapeshifting people. He tells several stories. My Mum (who worked as a dinner lady for Andrew and Edward's school). She met several Royals on several occasions, but not the Queen or Prince Philip. She even knew David Cameron when he was just a kid. My Mum's friend (now deceased), who was the Queen's dressmaker. Two close school friends - one was the son of the Queen's personal secretary, the other was the son of a Windsor castle estate worker. None of these people have ever mentioned any weirdness about the Royal family. In fact, I mentioned this reptilian idea to my Mum a while back, and she found it incredibly funny. The 'reptilian Royals' idea is made-up :BS:, and Arizona Wilder (whoever she is) has probably never even met the Queen. The thing is - and I say this advisedly - I think that David Icke is probably sincere in many of his beliefs. Unfortunately, he adapts these beliefs to whatever new ideas come his way, and there seems to be a never-ending line of nutjobs queueing up to tell him their version of the "truth". The fishmonger looks more reptilian. This was during a visit to the English Market in Cork. There is another picture in which she closely peers at a Game Stall but I can't locate it. There is another picture in which she closely peers at a Game Stall but I can't locate it. Was she trying to get a good deal on Far Cry 4? Heh! It was rabbits and pheasants and she looked as if she might devour them. 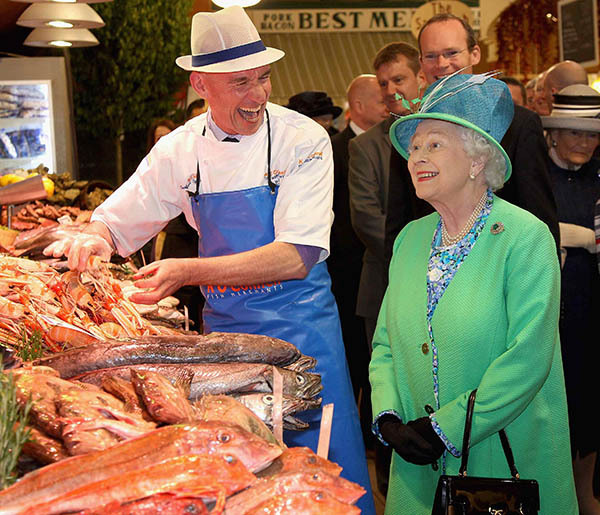 Well, her Maj is part of the huntin', shootin', fishin' set, so I think she's interested in anything like that. She even knew David Cameron when he was just a kid. Should'a killed him when she had the chance! He wasn't twisted and evil back then. Re Arizona Wilder and her ilk I think there's a bit of a Catch 22 when it comes to people who claim to have been Illuminati mind control slaves. If they really have been the victim of bizarre programming experiments, then they're likely to end up deeply psychologically scarred and with a tenuous grip on which of their memories are 'real' and which are drug induced hallucinations. Which in turn is bound to make them unreliable witnesses. Perhaps the objective reality involves some kind of MK ULTRA type project pumping test subjects full of psychotropic drugs, then exposing them to researchers dancing around wearing lizard masks. volunteering for dancing around wearing a lizard mask.... SIR! And that's the problem. Stories aren't evidence. Especially when they're filtered through a single source who might have a strong opinion on the subject. I disagree that stories aren't evidence. Most convictions in the courts are based on stories. I hardly think she's going to change in front of people. Oh NO! They must be part of the cover up! Love the BS smiley. That's a new one.